Check out the new Castaneda Lab Paper that we assisted with! Under stress, certain eukaryotic proteins and RNA assemble to form membraneless organelles known as stress granules. The most well-studied stress granule components are RNA-binding proteins that undergo liquid-liquid phase separation (LLPS) into protein-rich droplets mediated by intrinsically disordered low-complexity domains (LCDs). Here we show that stress granules include proteasomal shuttle factor UBQLN2, an LCD-containing protein structurally and functionally distinct from RNA-binding proteins. In vitro, UBQLN2 exhibits LLPS at physiological conditions. Deletion studies correlate oligomerization with UBQLN2’s ability to phase-separate and form stress-induced cytoplasmic puncta in cells. Using nuclear magnetic resonance (NMR) spectroscopy, we mapped weak, multivalent interactions that promote UBQLN2 oligomerization and LLPS. Ubiquitin or polyubiquitin binding, obligatory for UBQLN2’s biological functions, eliminates UBQLN2 LLPS, thus serving as a switch between droplet and disperse phases. 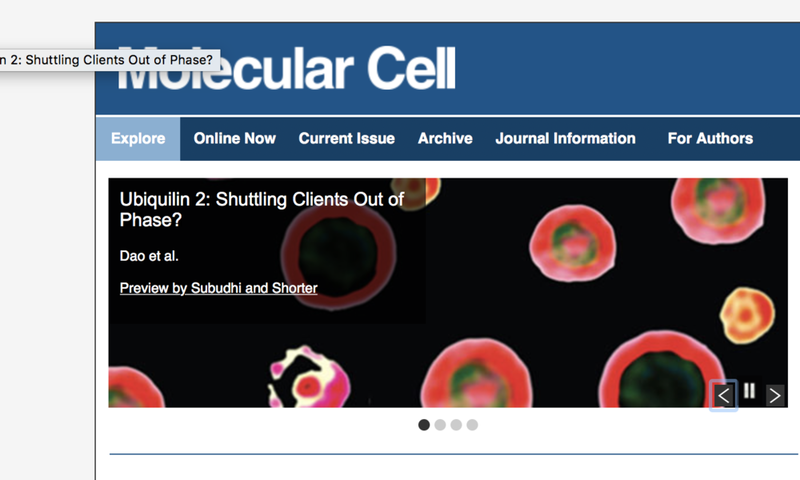 We postulate that UBQLN2 LLPS enables its recruitment to stress granules, where its interactions with ubiquitinated substrates reverse LLPS to enable shuttling of clients out of stress granules.